Cooling down in the hot summer months isn't easy—or cheap. 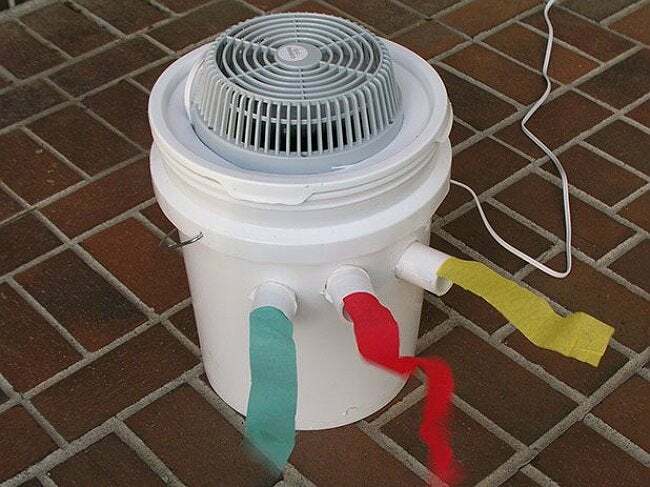 Save on your electric bill this season with a handy DIY that uses only a fan, bucket, and ice to help you chill out. We owe a lot to the humble air conditioner. Like most inventions, the idea came from a very real need: relief from extreme temperatures. The quest for cooler air has a venerable history. In ancient Egypt, people hung reeds in windows after dipping them in water; the water evaporated, cooling the air that blew through the window. Over time, innovators in China, England, and the United States transformed this cool idea into our familiar American household staple. But for all their virtues, modern in-window air conditioners are not perfect machines. For one thing, they cost a small fortune to run. But with a fan and Debbie Williams’ genius DIY, you can get all the benefits of a window AC for far less than a store-bought unit by using that same age-old concept: chilled water or ice. Besides an old fan and instructions, you’ll need to round up a utility knife, a five-gallon bucket (with lid), Styrofoam lining, 12 inches of PVC pipe, a hole saw or Forstner bit—and a gallon jug of water to freeze for later. First, place the fan upside down on the lid (so the airflow will be directed into the bucket), trace the outline of the fan on the lid, and cut it out with a utility knife. If necessary, saw off the fan’s stand or support, then fit your fan securely in the hole. Next, use the Forstner bit to drill three large holes through the bucket’s side, just wide enough for the PVC pipes you have on hand. Remove the lid in order to line the inside of the bucket with Styrofoam, then repeat with the drill so that the holes go through the lining too. Saw your PVC pipe into three pieces, each three to four inches long, and slide a section snugly into each hole. The unit works for about six hours at a time, but a tighter seal can extend that span by keeping the ice in the bucket cooler. 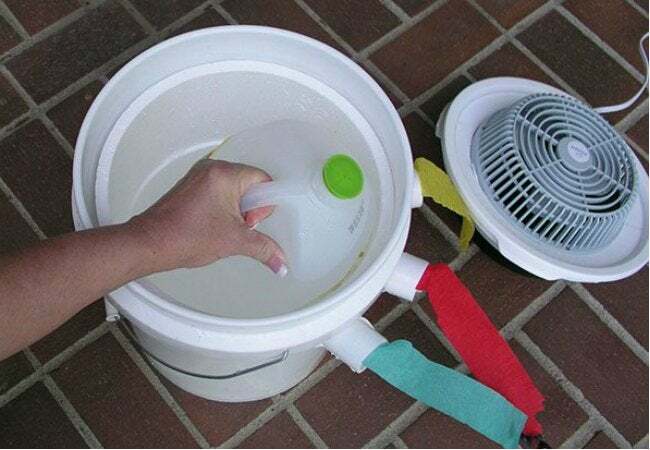 Finally, place the frozen jug of water into your bucket and replace the lid. Remember: The fan should be facing down. Go find the nearest electrical outlet, plug the fan in and switch it on, and your modified appliance will pass air through the cooler to chill—leaving you at a solid 68 degrees of comfortable. Then, grab yourself a chair and enjoy the breeze; all of this hard work deserves a breather.